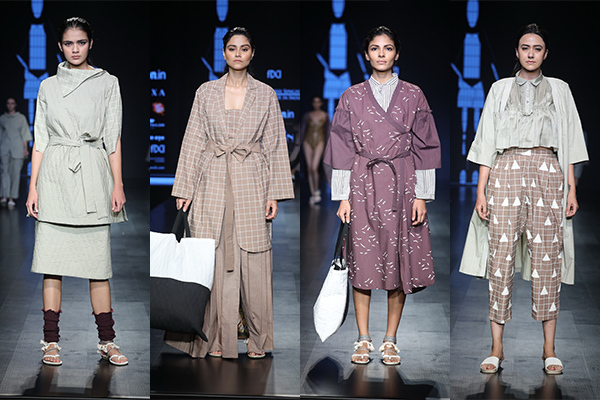 Picking up from where they left off with ‘Araki’ at AIFW SS’18, Shivan & Narresh’s new series captured the historic 17th century Edo Art aesthetic and amalgamated it with elements from Seychelles, presenting the dream wardrobe of every decadent traveler. Envisaged for the millennial on a luxurious getaway, key ensembles featured signature prints against a colour palette of cherry reds, Seychelles aqua blue, coco brown and powdery blues – perfect hues for a serene honeymoon or a splendid destination wedding. Schulen Fernandes for Wendell Rodricks presented a sensual collection in white that swirled around the form of the models to snugly envelop the body. Fabrics skimmed over curves in layered nuances and were embroidered in a minimal baroque style that exuded glamour and mystery. 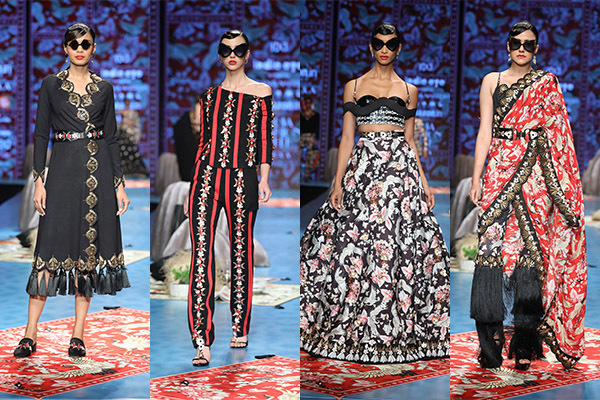 Shruti Sancheti’s Autumn/Winter 2018 collection celebrated the muted refinement of a peasant’s simplicity juxtaposed against the majestic decadence of a Tsar’s palace. Layered styles were embroidered with traditional Eastern European cross-stitched patterns in an ode to the modern gypsy soul. 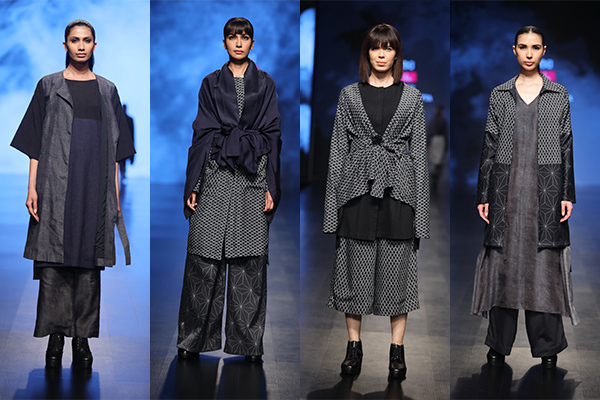 Titled ‘The Chillum Sisters’, Nida Mahmood’s collection comprised fluid relaxed silhouettes like oversized tops, tunics, blouses and over throws, flowing skirts and pajamas and anti-fit kurtas and salwars. Layering and mix and match were the key elements of this line with a colour palette that included dreamy blues, dusty peaches and pinks, burnt yellows and dull greens. 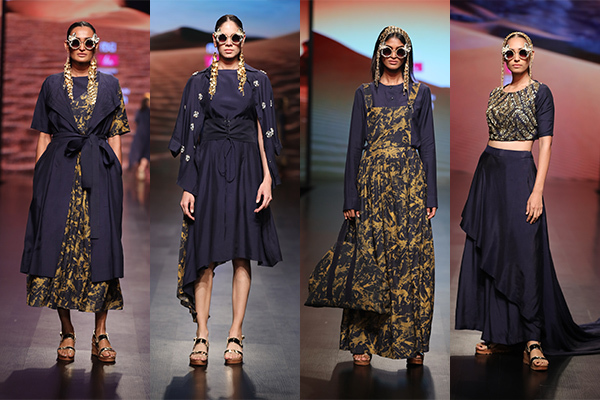 Layering and textured prints met basics at Gaurav Jai Gupta’s Akaaro capsule titled ‘The Upside Down’ which transported us to an alternate dimension existing in parallel to the human world. The creation of this realm was to issue a wake-up call to mankind with global mass consumption and unsustainable development at an all-time high which will inevitably lead to the exhaustion of planetary resources. 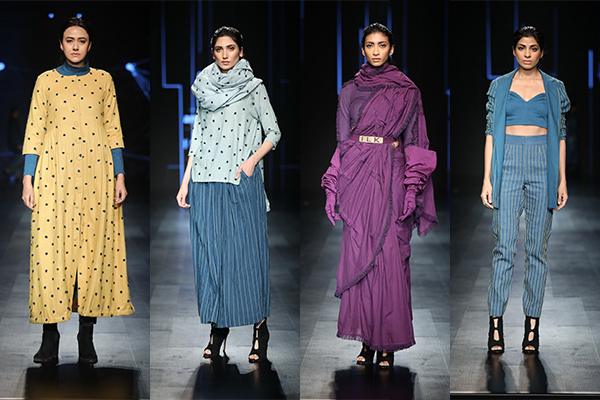 Eshaa Amiin’s intertwining of fluid modals and Bembergs in mustards prints was representative of a holiday wardrobe that progresses from casuals to destination wedding looks. Targeted towards the women who are mysterious, free-spirited and powerful, the collection focused on free-flowing, anti-fit garments. 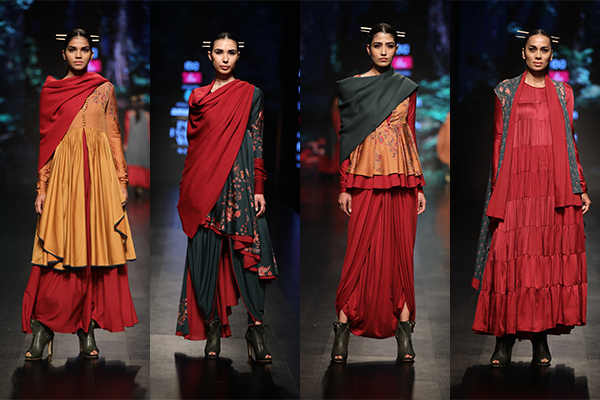 Ruby red, honey mustard and teal blue were the hues that dominated Anju Modi’s Autumn/Winter 2018 collection. Inspired by the enigma of a forest and the mysteries it beholds, the designer’s collection was an amalgamation of exquisite tropical prints and the traditional art of chintz. Tom Tailor presented three lines with The Historic Romance Collection celebrated the playful, easy and romantic essence of Indian summers, The Boss Girl that presented ensembles that were representative of the working woman’s tough business character and The Rock and Folk collection that includes darker hues once the preparation for winter begins in earnest. 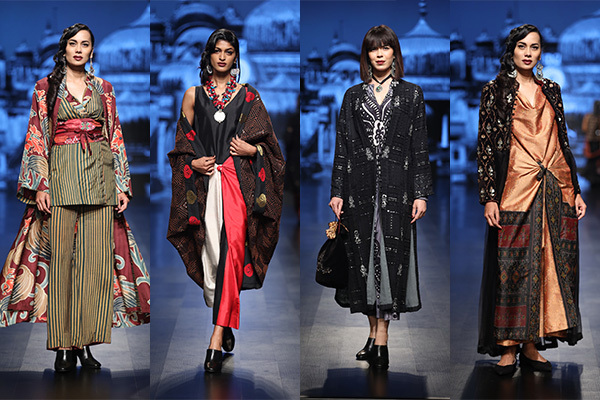 Sonam Dubal’s Autumn/Winter 2018 collection toed the line between vintage and contemporary garments with Ahimsa silk coats embroidered with wood beadwork that were layered with a contemporary silk jersey dresses. 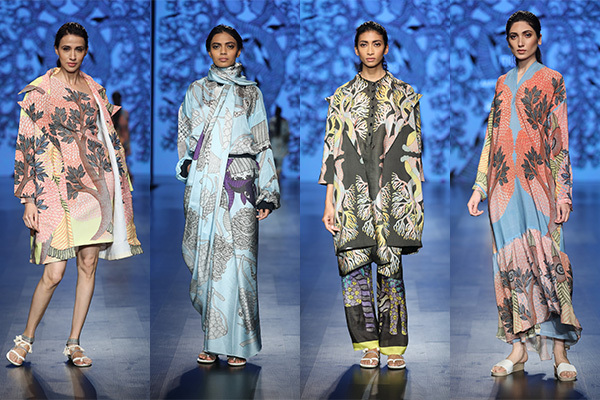 Easy and voluminous block printed and over-dyed pieces were paired with hand embroidered boiled wool capes. Titled ‘The Oracle’, the designer’s collection aimed at reflecting the rich heritage of craft, mirroring the preservation of tradition and interpreting it through beadwork, block printing and woven textiles. Having worked extensively with alternative fibres, Madhu Jain presented a clothing line in biodegradable Bamboo-Silk Ikat which drew inspiration from traditional Indonesian Ikat. The single colour palette of Indigo came in a burst of light and dark, with occasional lightning streaks that surprised. The show opened with a short Pung Cholam performance, also known as Mridanga Kirtan or drum dance, performed by dancers from Prasiddha Foundation. 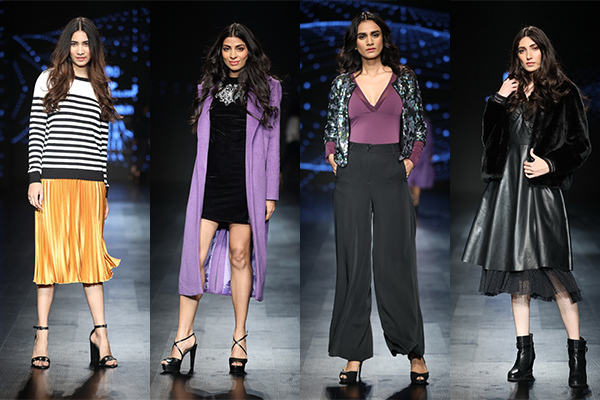 Ilk’s Shikha and Vinita used khadi cotton in the palette of blues, grape, teal and marigold. Creative layering, fabric accents and linear cord embroidery were some of the key highlight of the show. Presenting a collection that featured tailored boxy suits and wine jackets with gathers. 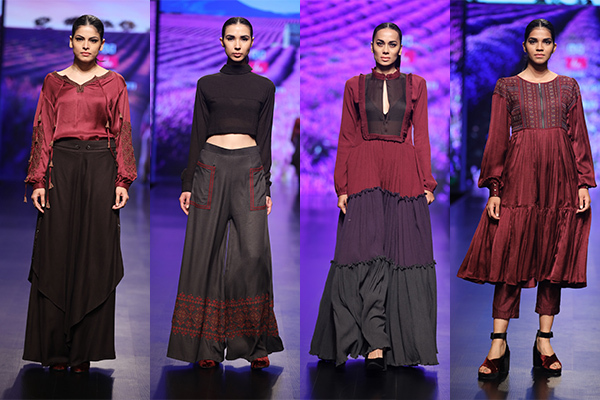 Abhi Singh’s collection oscillated between shape and abstraction, trying to strike a balance between the two. Aarti Vijay Gupta took inspiration from the Gondh art form. Translating the art form in her signature prints, the designer showed how print on print pairing will never go out of style. 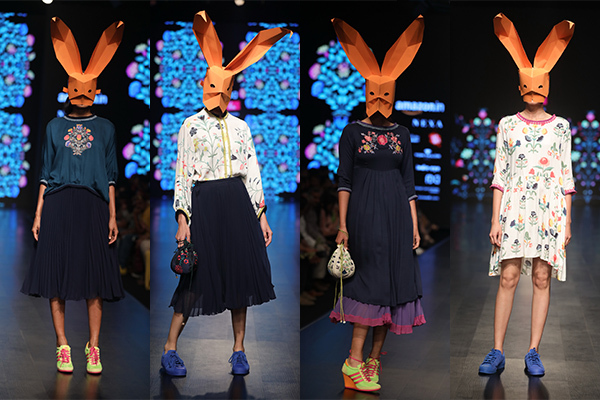 The ensembles ranged from saris to bomber jackets to trench coats to skirts and more.